50% Off 2nd Visit at Folly Farm Adventure Park & Zoo Must return within 7 days of the first visit to qualify! Folly Farm opened its doors to the public in 1988, and since then has gone from strength to strength; now they are recognised as one of the best days out in the UK for families. With something to do for children of all ages and plenty for the adults to get their teeth into too, a visit to Folly Farm is definitely a memorable experience. With a zoo, farm, AND a fairground to choose from, your little ones will surely be delighted with a great day out that brings some of their favourite places to go together under one roof. Whether you’re hoping to visit some lions, giraffes or penguins up close or want to learn more about how to look after farm animals, you can do all of this and more with your Folly Farm Adventure Park & Zoo discount. On the fairground, you and your little ones can blow off some steam on the giant big wheel, vintage fairground rides, dodgem cars, and more! Then, head over to the 700-seat Follies Theatre where you can enjoy awesome events and evening concerts. How do I use my Folly Farm vouchers? If you’re purchasing tickets on the day from the box office at Folly Farm Adventure Park & Zoo, you should take your discount code along with you and let the cashier know before you book. They will then apply your discount. Every day, there are a range of activities happening at Folly Farm Adventure Park & Zoo which you and your little ones can take part in such as animal feeding, meeting farm animals, milking goats, character appearances and the hugely popular land train ride. To make sure that you get the most for your money, plan your day around the timetable here. When Does Folly Farm Adventure Park & Zoo Open? Folly Farm Adventure Park & Zoo are open at various times throughout the year, depending on the season. If you plan to visit during the winter, they may not be open during the week. For more information on specific opening times to plan your visit, click here. Is Car Parking Free at Folly Farm Adventure Park & Zoo? As of January 2017, Folly Farm Adventure Park & Zoo have closed their main car park whilst undergoing renovation work. However, you can find free parking spaces available nearby. Click here for more information. Are There any Height or Age Restrictions? Most of the rides offered at Folly Farm Adventure Park & Zoo are suitable for all of the family to enjoy, however, certain rides may have height or age restrictions. To make sure that your little ones aren’t left disappointed, you can check restrictions for specific rides here. Opening Times can vary at Folly Farm depending on the season. Take a look online to plan your visit. 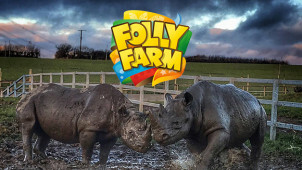 One of the leading attractions in West Wales since 1988, Folly Farm Adventure Park & Zoo is bursting with a range of activities for all the family to enjoy, with fun and games for kids and adults alike. Use your Folly Farm vouchers to save on your day out to a vintage theme park for thrill seekers, a zoo and farmyard where you and your little ones can meet various animals, and on-site family-friendly eateries. How Do I Use My Folly Farm Adventure Park & Zoo Vouchers? At the Adventure Park, there’s plenty to do but the highlight of the day for many visitors is the Jolly Barn, which is a farmyard like no other. A relaxed environment where everybody can meet a range of farm animals such as goats, chicken and sheep, along with their babies in the spring! The Jolly Barn isn’t just good fun, either – it’s educational as well with many different facts to learn about your favourite animals. If you’re planning a day at Folly Farm Adventure Park & Zoo, first things first, check to see if we have an offer available. You could get anything up to 2 for 1 on tickets, so it's always worth checking for the latest Folly Farm promo codes. If you're a regular visitor, we highly recommend purchasing a Folly Farm annual pass or season ticket - you'll be able to visit as many times as you want without paying a penny extra!